The man who’s driving this long and just-beginning-to-be-winding road has a very soothing manner. On another day I might – just might – find Fegan’s manner too soothing. Tonight, his aura of calm is perfect. I sink into the rear seat of a comfortable, far-too-clean-and-smart-for-us Land Cruiser – and I feel grateful. For everything. Fires burn in the hills, punctuating the blackness like scatters of glowing embers. From the charred ground sunlight will tug up vivid green shoots, heralding spring. But for now there’s fire, there’s darkness – and there’s smoke. I’m trying to relax, trying not to worry about the road, but it’s a fool’s game. I lean forward and stare through the front windscreen into what I can see of the road ahead. And what I can see is strange. First it looks like a milky haze, wisps of smoke, vanishing as we pass, like cobwebs on a ghost train. But then the smoke grows denser. The headlights create of it an opaque, chalky tunnel, in the middle of the road. I stop looking. But then I can’t help myself and return my gaze to the road. It’s more than just winter fires. We’re driving through a charcoal burning area. The way many rural people earn a living. Making bricks to build ovens. Chopping down wood. Filling hefty sacks with the precious black lumps, for sale by the roadside. Fegan is careful, but he’s straining to see through this veil of smoke – and he, too, has had a long, tiring day. Up before dawn, driving before the first flight flew into Lusaka – then despatched to rescue us. He weaves across the road – and quickly recovers. ‘Are you OK?’ asks Archaeo-man. ‘For now, I am,’ the reply. Concise – and honest. I feel the tension ratcheting up again. I think about the sinuous roads, the precipices, the carcases of cars and lorries, in the mountains beyond Luangwa Bridge. Leaning forward, I whisper into Archaeo-man’s ear. We should be there in an hour. They have accommodation. But it’s Saturday night – and day-trip distance from Lusaka. ‘I think this is a good idea,’ responds an audibly relieved Fegan. I just hope there will be room. To be honest, I start praying. We reach the bridge and even in the faint light of the stars – and my stunned state – I’m awed by the vast river and its beauty. The guard who stops us on the other side brings me down to earth. ‘Do you have a lighter for me?’ he asks. ‘Ah, no, sorry,’ says Fegan. He asks for nothing more – and lets us go. I wonder how long it is since he was paid – and feel sad we can’t fulfil his rather small request. Two kilometres down a dirt road, hugging the course of the river, we find the entrance. The forbidding barrier has a military-looking guard who raises it with not even a hint of a welcoming smile. The car scrunches up the steep slope – and we stop, confused. There’s not a single sign. Not a single light. ‘Have they gone out of business?’ Archaeo-man voices my thoughts. I’m already onto plan B – a nap in the car for us all – when he jumps down to investigate, vanishes round the side of a dark building, is gone what seems like an age. But then he reappears. With a light. With the owner. With a man who helps with our bags. Our little chalet feels like heaven. It’s small, the screens have seen much better days, but it has two beds, clean sheets, mosquito nets – and plumbing. I wash my hands. Sit on the edge of the bed, listening to the silence – well, what passes for silence in this land that’s never truly quiet. I think about the last time we stayed here. That was an emergency, too. We’d been lost in a hunting concession by night. Nearly 11 pm, we snagged the last available beds. Down by the campsite. We shared a bathroom with 50-odd men. Bikers, riding from Cape to Cairo. They snored and grunted the night away. Revved up en masse at 5 am. And they all used the bathroom before us. So, tonight, I luxuriate in plumbing. Private plumbing. No bikers. I put on cotton pjs, slide into bed and feel like a princess. No pea under the mattress, as far as I can feel. At 7 am we find a relaxed, beaming Fegan, checking the vehicle, ready for the last leg of our journey. Nothing happens quickly in Zambia – except maybe the sunset. So we sit over a leisurely breakfast, taking in the view that I find more than a little melancholy. Because here the river bends on its way to meet the Zambezi. And from that confluence slaves were carried off – to misery. 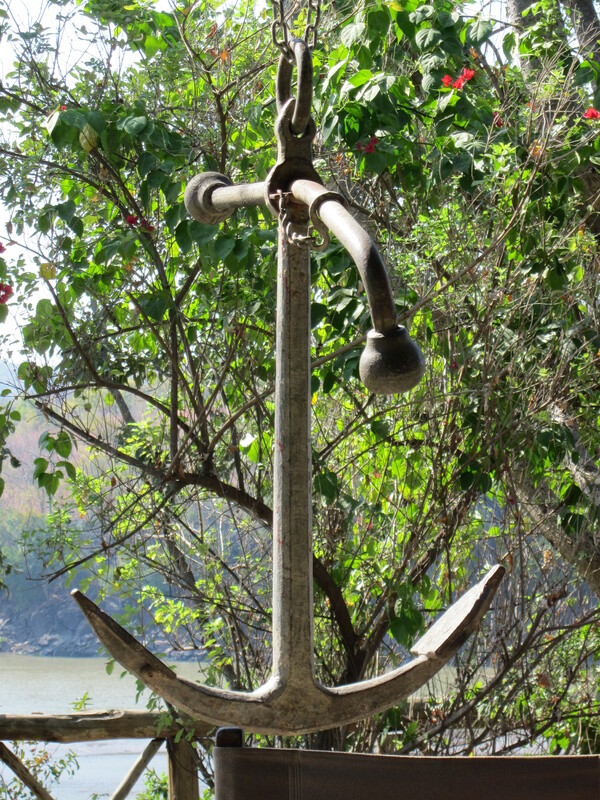 An anchor from a slave ship hangs from the roof – lest we forget. Breakfast over, bill paid, we leave, our rested spirits buoyant in the sunshine. Glad to be alive. The hills hold no fear for me now. Fegan drives so well I cease to look ahead. Instead I look around. At the world. Three hours later and we’re back in the sanctuary of Pioneer Camp, its trees, its birds, its diligent staff – and its character of a barman, Alfred. His cellphone was busy for us, yesterday. We sit, dazed, in the sunshine, staring at – what? I don’t know. Then we notice something missing. Yes, back there, in that place between Nyimba and Petauke, the place that is somewhere, but whose name we never learned, two heads are shaded by new hats. Well, one is new – and brown and rather smart, as these things go. The other is tatty, green and frayed around the edges. That one’s mine. ‘It take a bit of the shine off, doesn’t it?’ says a rueful Archaeo-man. I don’t think so, not really. In fact, the more I think of it, the more reassured I am by the thought that the only thing we lost, yesterday, was possession of our sun hats. A minor loss for a major rescue. And, you know, the thought of those hatted heads, out there, somewhere – it makes me smile. This entry was posted in If you only read one ..., Zambia and tagged charcoal burniing, Great East Road, Land Cruiser, Luangwa Bridge Camp, Lusaka, Nyimba, Petauke, Pioneer Camp, slave trade, Slavery, Travel, Zambia. Bookmark the permalink. 4 Responses to That road – dejà viewed. Part 4: the journey’s end. Were you going to a dig? Were there people expecting you? We were on our way to see a Chief who has donated land not too far from Mfuwe airport for the building of a heritage centre, the project we have been trying to get off the ground for the last 8 years – that’s where quarter of the proceeds from my book are going – though they will make very little of a dent in the big sums needed I’m afraid! I had hoped that as the donations were going to the Liverpool University Africa Endowment Fund they would support it but … Ho hum. The other things we had to do on this trip were to meet the Minister for Chiefs and Traditional Affairs (tick) to obtain her support for the centre and a future archaeological project and for Larry to do some remaining work on the Lost Great Lake project (tick) so two thirds done, not bad. Just a shame we didn’t get to the Valley as it would have been my first trip to ‘Elephant Camp’ since I published my book. Never mind. Thank you for the news. I remember you mentioned the heritage centre a while ago. How very pleasing and admirable that you were given the land. Yesterday evening I watched a TV programme about people on the Zambezi, from the Falls to the Lower Zambezi National Park. 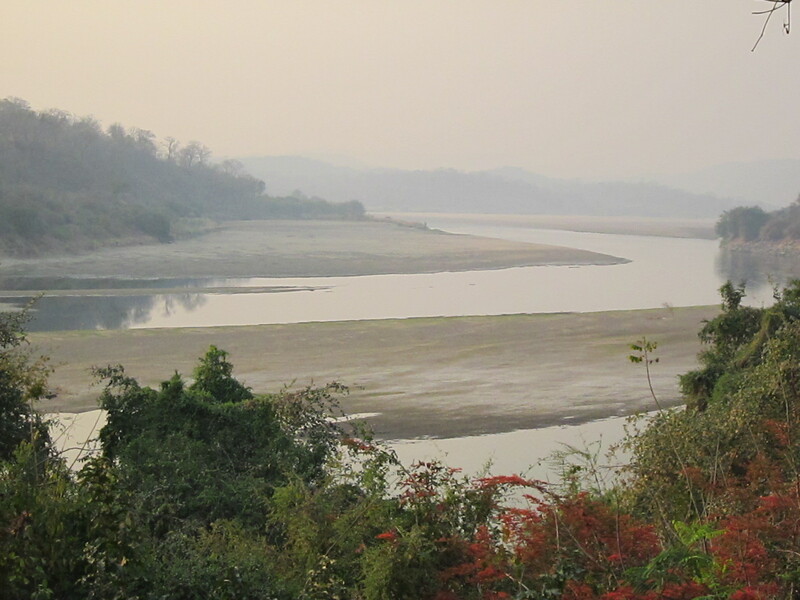 The views and the elephants on the river bank reminded me of your Luangwa. “Elephant Camp” – is that the Chowo site? Perhaps there are several. I look forward very much one of these days [you’re gonna miss me honey – see what I mean about old songs?] to reading about that LGL. ‘Elephant Camp’ is the (fictional) place that Prof Lamb and Dr Sommers stay when in South Luangwa – though some might say it bears more than a passing resemblance to Wildlife Camp, where, it so happens, I have stayed many times!The LGL project will be published at some stage though in academe as you know these things run exceeding slow. And nothing can be said about it to the wider world till that happens and Nat Geog approves. Sorry. Frustrating. Will keep you posted.